Our Malaga cruise port guide gives you information about the docking location, cruise dock, transportation options and much more! 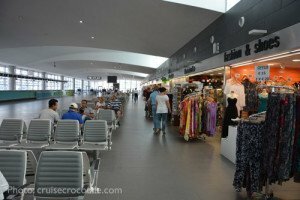 Welcome to the Malaga cruise port guide. Malaga is the 6th largest city of Spain with 570.000 inhabitants. This sunny town is by right called the centre of the Costa del Sol and it is one of the most interesting towns in southern Spain. Malaga is like an onion. It you would peel of the layers of the city a new part of history would reveal itself. Malaga was founded about 3000 years ago. The Phoenicians, the Greeks, Carthaginians, Romans and the Moorish would all conquer the city at one point or another. Many clues about this are still visible in the city today. Even if you are not interested history Malaga is still the perfect spot to spend the day. It has that perfect combination of beach, sun, shopping, cultural and history. Whatever your interests are you will never find Malaga disappointing. Check out the Malaga cruise port guide underneath for practical information and tips. This is the large cruise terminal in Malaga. This is where the bigger ships dock when calling into Malaga. Inside the cruise terminal you will find several shops and free wi-fi. 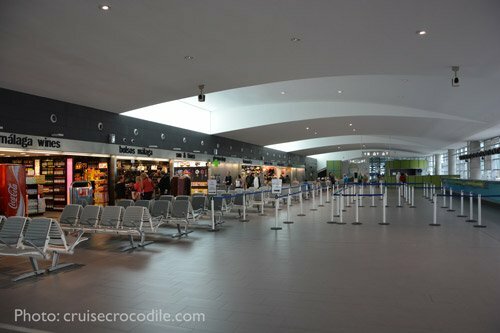 This is another picture of the inside of the Cruise Terminal building. Find your favourite souvenir in one of the shops here. 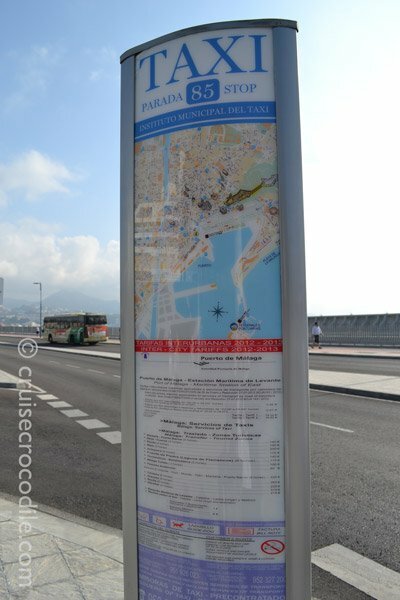 In front of the cruise terminal you will find this sign with the taxi prices on display. 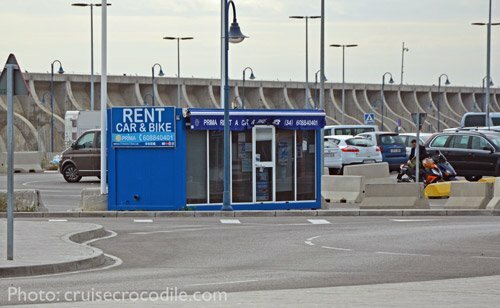 Where ever you dock in Malaga there is always a car or bike rental close be. You will find this booth at the Malaga cruise terminal / Eastern wharf. Check out the map above for more car and bike rental spots. How are you? – ¿como estas? You can check ahead of time where your ship is scheduled to come in. Go to the following link: http://puertomalaga.com/web/guest/atraques and put in your day of arrival. Check in the map above where the berth is that your ship is scheduled to be at. Keep in mind they only schedule a couple of weeks in advance. Eastern Wharf; also known as Muelle Levante Atraque Sur and Muelle Levante Atraque Norte. This is where the larger cruise ships have to dock. 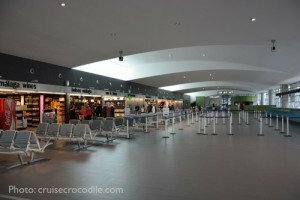 The dock has a terminal building with all kind of facilities like tourist information, wi-fi, souvenir shops, taxi stand, car and bicycle rental. From here it is about 2,5 km walk to get to the city centre. Some cruise lines will provide their own shuttle service to the city centre and some cruise lines will use a port shuttle service in this case. Check with the front office on board what option they will provide. Most of the times both shuttle busses will drop you off at Plaza de la Marina. This square is right in town. See map above for its exact location. These wharfs are suitable to accommodate smaller cruise ships. From here you are only a 5 minute walk from the city centre. Plaza de la Marina is the closest square to the dock. Here you will find Tourist information, horse carriage rides, Hop on hop off bus, bicycles for rent and public transportation. 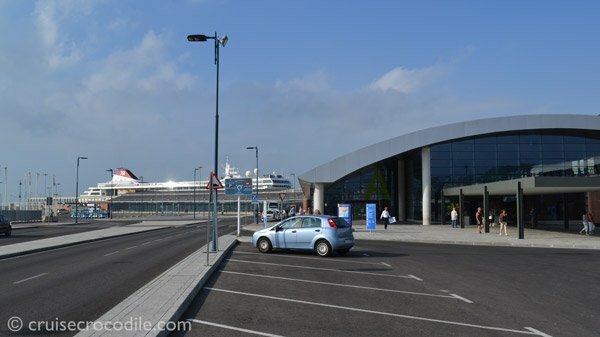 Cruise liners generally do not provide a shuttle service into town if you are docked at this berth. These prices are per taxi, up to 4 people and round trip. At the Eastern Wharf you will find a car rental office where you can also rent bicycles for a day. If you are docked at Wharf 1 to 9 you will find this at Plaza de la Marina. See the map above for some locations for bicycle and car rentals. 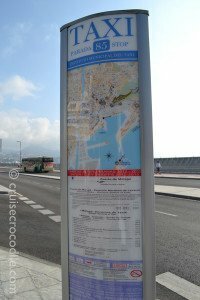 There is a hop on hop off bus service in Malaga, but they generally do not come to the dock. Find them in town. There is no spot in Malaga where history becomes so tangible as here. The Alcazaba castle still proudly dominates the skyline of Malaga. It was a castle build by the Moorish in the 8th century. It would eventually fall to King Ferdinand in 1487 when they would reclaim Spain, unite it into 1 country where the Roman Catholic faith would once thrive again. Climb the stairs to get to the top of the castle or take the elevator. Finding the location of the elevator is quite hard, but the location is marked for you in the map above. On the Calle Guile Sotelo you will find the entrance to the elevator going up to the Alcazaba. Keep in mind the entrance is a bit hidden away and therefore it is quite handy to keep the street name at hand. Catch the elevator for just a couple of euro. Pablo Picasso is one of the greatest and most influential artists or the 20th century. The Picasso Museum in Malaga has 233 works of art in 11 galleries. Find many prominent pieces of art like Jacqueline seated, Women with Raised Arms and Acrobat here. Keep in mind there can be long queues at the museum. Find its exact location in the map above. About 37 km from Malaga you will find Mijas. Southern Spain is famous for its white villages and Mijas would a great example of where you can find the typical Andalusian white houses. The villages is a web of small streets, complete with terraces, red rooftops and tiny squares. Take a donkey taxi or horse carriage to tour around the city or simply walk through the city to visit its bullring, viewpoints and church. At the foothill of the Alcazaba lies the roman theater. It was discovered in 1951 after being covered for centuries. The theater is from the 1st century BC. During the Roman era Malaga was part of the Roman province. This theater was built during the reign of Augustus. It was essentially used until the 3rd century. Visit the Roman theater and all of the historical landmarks surrounding it. It is a gem to explore. 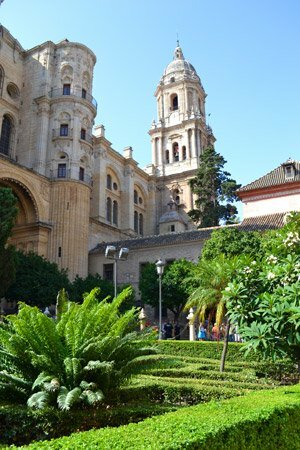 The famous “one armed” cathedral in Malaga is a must see in Malaga. The first stone was laid in 1528. The cathedral would be build on the sight of the formed mosque. Eventually the city would run out of money, leaving the cathedral with only 1 tower. This is why it has gotten its nickname: “One armed”. Throughout the centuries the 2nd tower had never been built because of budget challenges. Today Malaga would have the budget to do it, but unfortunately adding on the 2nd tower would mean the cathedral would collapse and therefore it will always remain the “One armed”. This is one of the most popular beaches in Malaga and it is within walking distance of the ship. It is a town beach, populair among the locals and about 1,5 km long. Find all kinds of nice bars and restaurants here. Just outside of the city centre you will find an old tobacco factory. Inside you will find one of the most important vintage car collection in the world worth over 25 million euro. 80 cars from all kind of decennia are showcased here in this private collection. You will also find clothing and hats from the 20’s, 30’s, 40’s and 50’s here. This cafe would be perfect for a refreshment in between all the sightseeing. Find this cafe opposite the Roman Theater in the city centre. Sit down and enjoy some nice Malaga wine or tapas. Don’t forget to have a look inside. You will find barrels signed by well known visitors or regulars like Antonio Banderas. The Alhambra is a location that should be on everyones bucket list. It is one of the most stunning structures in the world. Roam the premises, courtyards and gardens to get a feel for this Moorish castle. You will find the Alhambra in Granada which is about 135 km from port (just over 1,5 hours drive). If you want to go independently make sure to pre book your tickets online well in advance through the official Alhambra website. Plaza de la Merced is located in the historical quarter of Malaga. It a beautiful squares displaying the beautiful architecture of Malaga. On the square you will also find the house (number 15) where Pablo Picasso was born. Pablo Picasso House Malaga is the city where Pablo Picasso was born in 1881. He was born on Plaza de la Merced on number 15. The Picasso family lived here on the 2nd floor. The original furnishings are nog longer here, but you will find a permanent exhibition of ceramics and sculptures by Picasso. If you dock at the Eastern wharfs and you decide to walk to the city centre you will walk over the Muelle Uno. This area is full of shops, restaurants and other facilities. It is great to catch a refreshment in between while on your way or back from the city centre.